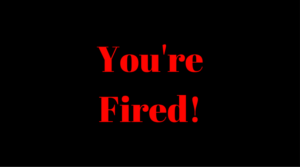 What to do if You’re Fired? Being fired happens to a lot of people. It happened to me once in college. Depending on the job you may go through different emotions. Some of you may have hated the job so you will be happy while others could have loved their position so much that they will be sad. Being fired doesn’t have to be the end of the world. I want you to realize that you will bounce back, maybe better than ever. Today, I want to go over a few things that you should do if you’re fired. Do not freak out. Getting fired is not the end of the world. It’s natural to feel mad or sad for a little while, but don’t go overboard. Things happen for a reason. You will have another job in no time. The next thing that you should do is get your finances together. Look over your budget and adjust it for the next few months. What on there is a necessity? What on there isn’t? Cut as many expenses as possible because honestly, you don’t know how long you will be without a job. It may be difficult, but this is the time where you have to sacrifice for you and your family. A lot of people think that only people that are paid off can file for unemployment, in most states most employees that are fixed can file. The only way that they can’t is if they were fired for intentional misconduct. You should file for it as soon as possible. The unemployment will provide you with money weekly until you find another job. The benefits won’t be as much as you were making at your job, but it should be enough for you to survive on. Reaching out to people that you know is a major step once you’re fired. They may be able to put you on the fast track to another job. Your network is vital too. Even if they can’t help get you a job at that moment, they can keep you motivated and help you keep your spirits up. The final thing that you should do if you lose your job is to start side hustling. You should do that until you get another full-time job. A few side hustles that people have done create websites, tutor, sell sweets, wash and detail cars, provide child care, sell items on Craigslist and drive for a company such as Uber or Lyft. As you can see, there is money to be made even if you get fired. Get out there and get it. In summary, the things to do if you’re fired are not to freak out, get your finances together, file for unemployment, reach out to people and find a side hustle. People get fired all the time. It’s all about how you look at it. If you believe in yourself, you will be back with a job in no time. Keep your confidence high. I was fired once when the manager wanted to bring in someone that he had worked with before. It was a tough blow but staying a believer in my skills kept me going.